Northwest African cheetahs and barbary macaques are among the critically endangered mammals of Algeria. The barbary macaque is a mammal that can be found in Algeria. Algeria is a sub-Saharan Mediterranean country in North Africa. It is the largest country in Africa to have a desert belt and Mediterranean coast, as well as highland environments provided by the Atlas mountain range. These regions provide a home to the rich and diverse fauna of Algeria, including about 100 species of mammals, some of which have been identified as threatened. Most of these endangered mammals are protected by Algerian law to increase and stabilize their fragile populations. The northwest African cheetah is a nocturnal mammal that can be predominately found in the Sahel and Sahara desert in Algeria, as well as parts of the Ahaggar highlands. It is critically endangered. Its nocturnal behavior helps the cheetah to adapt to their hot climate by conserving water. Additionally, the northwest African cheetah will intake water by consuming the blood of its prey. The cheetah has a short whitish coat with black or light brown spots. The cheetah is semi-nomadic and hunts solitarily, feeding on antelopes found within its desert range as well as hares or rabbits. The Barbary is an endangered primate found in the Atlas mountain ranges of Algeria. 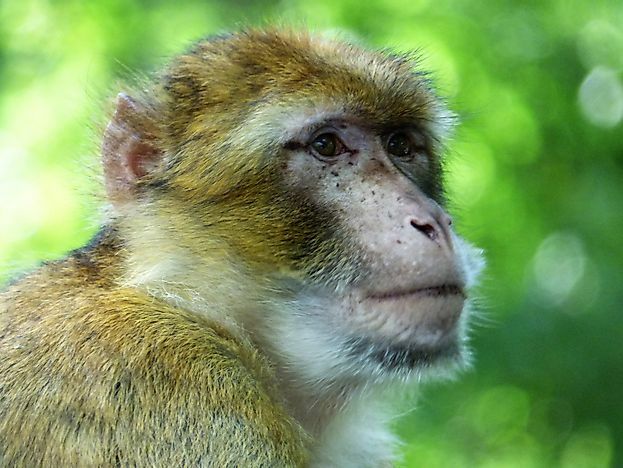 The macaque feeds primarily on plants and insects. Their habitats include grasslands, forests and rocky ridges with plenty of vegetation. The monkey is mainly social with groups of up to 100 individuals led by a female. The males and the general population of the monkey are actively involved in the rearing of young. Their populations are threatened by deforestation, predation, and habitat loss. The Mediterranean monk seal can weigh up to 70 lb can live up to 45 years of age. Although historically sighted on beaches and other areas frequented by humans, the monk seal is thought to mostly inhabit deep caves. These caves are often in rugged areas not easily accessible to humans. The entire population of the Mediterranean monk seal is thought today to be fewer than 700, with a small population estimated to exist off of the Mediterranean coast of Algeria. Cuvier's gazelle inhabits the Atlas mountain range of Algeria, where they graze on low grasslands. They tends to run in social groups of between four to eight members. They have the ability to move at an extremely quick speed of up to 50 miles per hour, which, paired with their alertness, makes an effective defence against predators. However, there are estimated to be fewer than 2000 remaining in the wild. Threats to the population include food competition and human activity. Mammals in Algeria contribute to the biodiversity of the Sahel and Sahara region. Protecting these species is of great importance to the area and outside communities who interact directly or indirectly with these mammals. Among the threatened mammals in Algeria are the Northwest African cheetah, Barbary macaque, Mediterranean monk seal, Cuvier's gazelle, and Rhim gazelle.